If you’re starting with dirty brushes, scrape off as much paint as you can. Using water-based paint? Wash your brush in soapy water and rinse until the water runs clear. Dry on a clean cloth. Using oil-based paints? Then your brushes need to be cleaned with white spirit or, better still, a specialist brush cleaner. Pour a small amount into a jam jar and work the brush against the sides to get the cleaner into the base of the bristles. You’ll need to do this a couple of times before giving the brush a final wash in soapy water. You shouldn’t pour solvents down the sink, so pop a lid on the jar and leave for 24 hours till the paint sinks to the bottom. The rest of the brush cleaner can be tipped back in the bottle for future use. 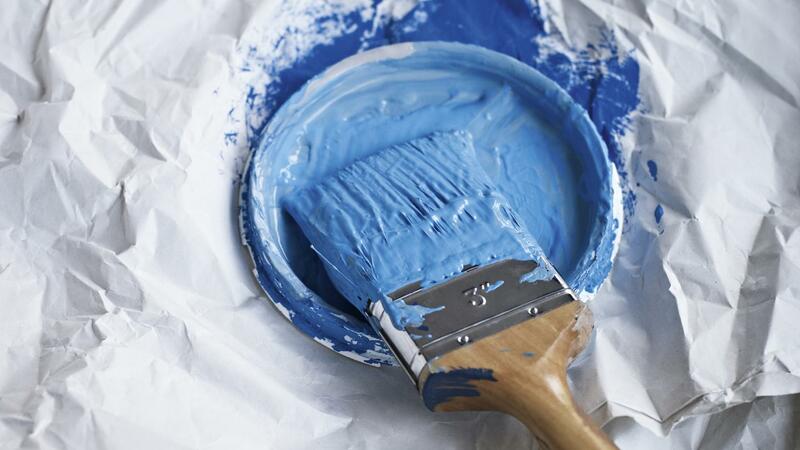 Leave the paint in the jar to dry before putting in the bin. Still got painting to do? Instead of washing your brush in between coats, wrap them in cling wrap. This will keep them soft and in tip-top condition.